This recipe makes enough cocktails to almost fill a 2-quart pitcher, about 1.5 quarts. It's prettiest served in hurricane glasses, but tastes just as good in plastic cups! In a large pitcher, mix the pineapple, orange and lime juices. Add the rum and set aside. For each individual serving glass, pour in one Tablespoon of grenadine syrup. Fill the glass with ice. Prepare your garnishes beforehand by skewering citrus slices and cherries on toothpicks or cocktail sticks. When ready to enjoy, pour the rum punch into each glass to allow for a sunset effect. 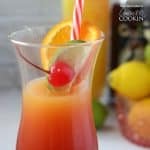 This recipe for Rum Punch Cocktail was printed from AmandasCookin.com - https://amandascookin.com/rum-punch-cocktail/ and can only be printed for education or personal use.